Ok, I was doing some modding a few years ago and am looking at my files again. One thing I was never able to figure out was how to make say the Repulsion wave into a turret. This is For A1. Can anyone provide a hot to on that and would it work for other special weapons too? I can't walk you through it at this point because I don't even remember what I did to get this to work, but here are some links to the odfs for the repulse as a primary, not special, weapon. Never posted files before; looks like you'll have to copy and paste this stuff into blank odfs. Hope you enjoy, though! do i you know how i can keep all 5 special weapons on the defiant class so far iv managed to get all 3 to work out of 5? ok where can i find these button number's is it these jus the fact that im usin battlestations mod at the mo and lovin it. weaponHardpoints8 = "hp05" "hp06" "hp07"
uss_shanker wrote: ok where can i find these button number's is it these jus the fact that im usin battlestations mod at the mo and lovin it. Those just dictate what hardpoints to use for that weapon(cause of the "hp" in front of the numbers obviously). The number you want is in the actual special weapons file(two files for each just like normal weapons), although I think its the one thats referenced in the ships odf file. EDIT: I was right its the ones that start with "g" like "gmanheim". im surprised that doesnt crash. Im guessing either the chain reactor or a phaser doesnt work since they both use hardpoint set 3. Keep Weapon 1 with Hardpoint 1. In the special ordinance it states "ButtonSlot = " not the ship ODF. 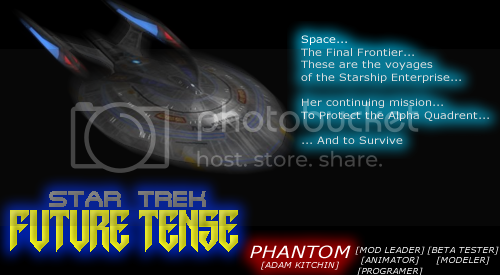 ok phantom and doci iv set the special energy weapon to 1500 wich is on the nebula class and all 3 buttons work deflector burst cloak and corbomite wat would be nice is the 4th sheild disrupter itl b the best defiant class ever. Are the weapons you posted above all of the ones that you put on the ship? I don't know anything about the Battlestations mod, but it doesn't appear that the Shield Harmonics Disruptor weapon is on your list (unless relpuls, relphot, or relphas works like the shield disruptor). gshieldh should be the proper odf for that weapon.